Cebu City is a throbbing, lively, and a quintessential multifaceted South East Asian city. It’s a port city, of population close to 10 lakh or 1 million, and with distinct influences of its Spanish Colonial past. It is the seat of government for the province of Cebu which includes the cities of Carcar, Danao, Lapu-Lapu, Mandaue, Naga, and Talisay. Cebu does not usually feature on top destinations in the Philippines, and maybe rightly so, but there’s still plenty to do. Here’s a quick and easy one-day travel itinerary for Cebu city. Top things to do. Hiring a car for the day is probably the best and cheapest option to get around the city. For an 8 hour hire, it cost me around USD 50. Request your hotel to arrange a car for you. Or take a coach tour such as this one which also covers Mactan. A central hotel right next to Ayalla mall is Seda Ayala Center Cebu where I stayed. I was happy with it. Other well-rated options are Harold Hotel and Red Planet Cebu. Anthony Bourdain has talked about it, so it cannot be that bad, eh? Jollibee is a food chain pretty much like MacDonald’s or KFC, but with a local character. Residents love it, so why not try it to see what’s so great about it? Your options vary across rice, chicken, burger, hotdog, coffee, and milkshakes made in a very local way. I really enjoyed the burger steak with spaghetti and halo-halo, made with mung, garbanzo, white beans, shaved ice, coconut, evaporated milk, colored gelatin, jackfruit, sweet banana. Fort San Pedro is one of the remnants of the many years of colonization that followed after the Spaniards first landed in 1521. The fort was built in 1738 by Miguel López de Legazpi to protect the city against Muslim raiders. The fort itself is quite small and will take around 30-45 minutes to cover. Entry is 30 PHP or 50 cents. Close to Fort San Pedro is another monument from the Spanish period, the church of Santo Nino dating back to 1565. Inside the basilica, you could view (and kiss) Santo Niño de Cebú or the Child Jesus at the main altar and place candle offerings outside. Go to the museum after. The mass in English happens at 9 a.m. in the morning. From the Basilica, head straight over to the Magellan’s Cross nearby. Why is the cross significant? Well, here goes. The arrival of the Portuguese explorer Ferdinand Magellan in 1521 began the Spanish colonization of Cebu. After losing the favour of King Manuel I of Portugal for his plan of reaching the Spice Islands by sailing west from Europe, Magellan offered his services to King Charles I of Spain. On 20 September 1519, Magellan led five ships with a total complement of 250 people from the Spanish fort of Sanlúcar de Barrameda en route to Southeast Asia via the Americas and the Pacific Ocean. They reached the Philippines on 16 March 1521. Rajah Kolambu the king of Mazaua told them to sail for Cebu, where they could trade and obtain provisions. The Magellan’s cross is an interesting enough visit. You can fall for the tourist trap and make a wish at the altar. 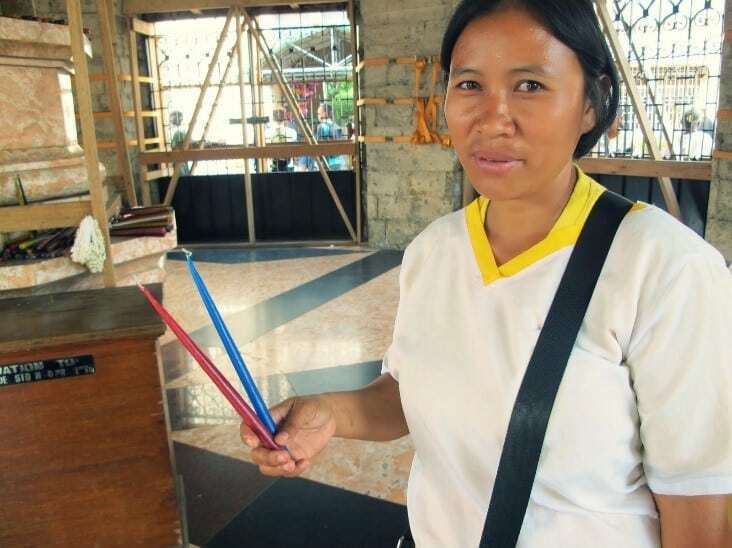 Pay the smiling lady in yellow and white 20 PHP a candle and she will pick a candle for you at random. 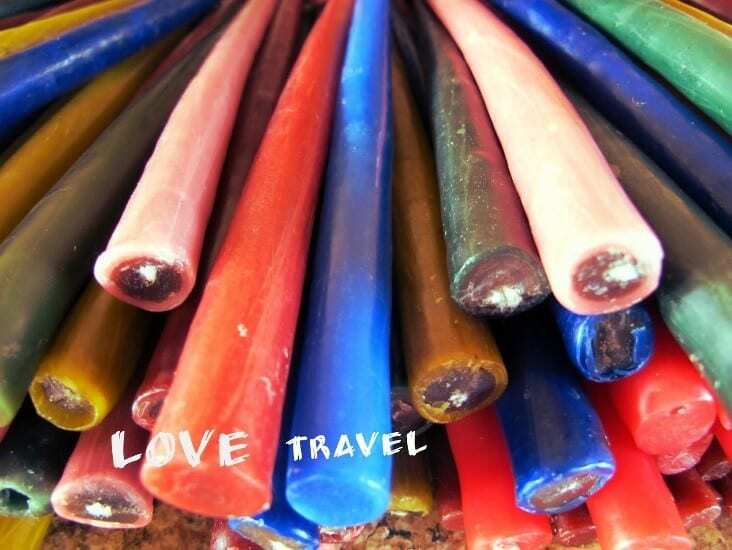 I picked a red (love) and a blue (travel). After you’ve picked the candles, she will heave and shake her body, mumbling incoherencies, to purportedly pray for you. It filled me with hope. At least, momentarily. 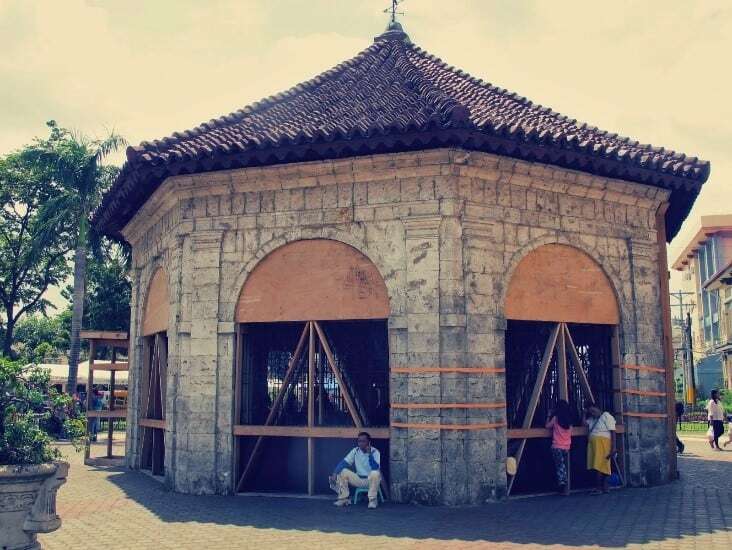 The Cebu heritage monument gives a snapshot of Cebu’s history. It’s quirky and quite fascinating. The structure is a mish-mash of several events in its history and has ships, churches, crosses, and key people, among others. Several sculptures and artwork made of concrete, brass, steel, bronze merge into one another and then diverge. A 10 minute stop. Across the road from the Cebu Heritage Monument, is the late 17th-century house of Yap-Sandiego. The house is filled with contemporary and ancient artworks, antique pieces and Cebuano-made native furniture. You can pay 50 PHP or 1 USD to enter or peep from the sides of it, as I did (I was hungry!). Open from 9:00am to 6:00pm. Head over to Philippines’ oldest and the shortest national road (whatever that means) Colon. Once the epicenter of Cebu City’s shopping and business activities, the street today is crowded, a bit rundown, dirty as hell, but worthy of visiting for a peek into local ways of life. There are some good eateries here such as Cebu’s Original Lechon Belly. Eat the nation’s favourite dish, lechon or the suckling pig. In fact, food was what I remember most from my trip to Cebu. Each dish colourful, each portion piquant and plentiful. Lechon is another remnant of the city’s Spanish past. Lechon is served with vinegar and rice, and its uniquely wholesome flavor is PRETTY hard to forget. You could try the Lechon in Colon if you have the stomach for it, or if you prefer more sedate surroundings, try it at the House of Lechon on Acacia street, 15 minutes away. Cebu’s Taoist Temple is located in Beverly Hills Subdivision of Cebu City. At a height of 110 meters ASL, the temple grants great views of the surrounding areas and includes a chapel, a library, a souvenir shop, and a wishing well inside. There are impressive statues and decorations around that make for an entertaining hour-long walk. Not to mention that climbing the 81 steps to the altar (representing the 81 chapters of the Tao scriptures) helped me workout the heavy lunch consumed an hour ago. If very tired, or heck, even if not, try the inexpensive and very relaxing spas at Cebu. Spa Esc at the Radisson Blu hotel located at Corner Juan Luna Avenue is one of the top spas in the city. According to the AsiaSpa magazine, a few others of note are: Chi at Shangri-La Mactan, Aum Spa at Crimson Resort and Spa, Mogambo Springs at Plantation Bay Resort and Spa, Spa del Mar at Movenpick Hotel Mactan Island, Anuma Spa at Maribago Bluewater Beach Resort, Badian Natural Spa & Thalasso at Badian Island Resort & Spa, and Undina Spa at Pulchra. Why go to a shopping mall, you ask? The Ayala mall at Cebu is less of a shopping extravaganza (which it is) and more of a vibrant playground for people watching. Locals throng to it every evening, and one can spend hours sitting in its food courts or the top balconies merely people gazing. The mall also has a good collection of local handicrafts and boutiques. The array of food to sample is simply amazing. Load up on your Cebu gifts at Island Souvenirs. Cebu is an easy city to get around in. There are plenty of cheap options: cars, buses, rickshaws, taxis, but the most amusing to me were the colourful Jeepneys. They sport quirky artwork on their sides and are apparently representative of local art and culture. Go to Top of Cebu or Anzani for dinner with a view. Cebu lights up like Disneyland at night and quite transforms. If you have more time, take a few day trips. Mactan is about an hour away by car from Cebu city. Since Mactan is a coral island, it offers some of the best diving, snorkelling, and island hopping options in the Philippines. Take a marine tour in a glass bottom boat or go diving with SK divers. Shangri La‘s Mactan Resort & Spa is a 5-star resort owned by Shangri-La Hotels located on the island of Mactan, Cebu. The resort has its own private man-made beach cove and its own marine sanctuary covering 6 hectares that holds over 100 species of fish and corals. I spent half a day at Shangri La, sipping on the local beer and tasting their chef special, beef shank soup. Hotels are inexpensive in Cebu City, ranging from USD 40 to USD 100 per night. I stayed at Seda Ayala Center Cebu which was satisfactory; the best part being it was right next to the Ayala Mall. Rooms at USD 100 / night. Red Planet Cebu. Close to all attractions. Room at USD 50/ night. It is easy to get into Cebu City by air (though the airport is nothing to speak about). Most flights stop-over at Manila on the way. You will need to pay an airport tax on departure from the city. The cost is around 750php and payable only in cash. Great itinerary! I have a soft spot for Jolibee! I loved the Philippines but did not visit Cebu. Your post with great tips is a good reason to think about coming back. Thanks for sharing. Cebu looks like such a thriving place with a mix of traditional culture and modern elements. I love your photos. I would love to visit the Philippines one day and Cebu is definitely on my list. I’ve never heard of Cebu. Now, I want to see this place and experience all the sights that you mentioned. What an interesting city! I wanted to come here so bad while I was over there and never did! You’re making me want to go back! !